Home › News › News Releases › Irreverent billboard campaign continues in Cobb County, Ga.
Irreverent billboard campaign continues in Cobb County, Ga. 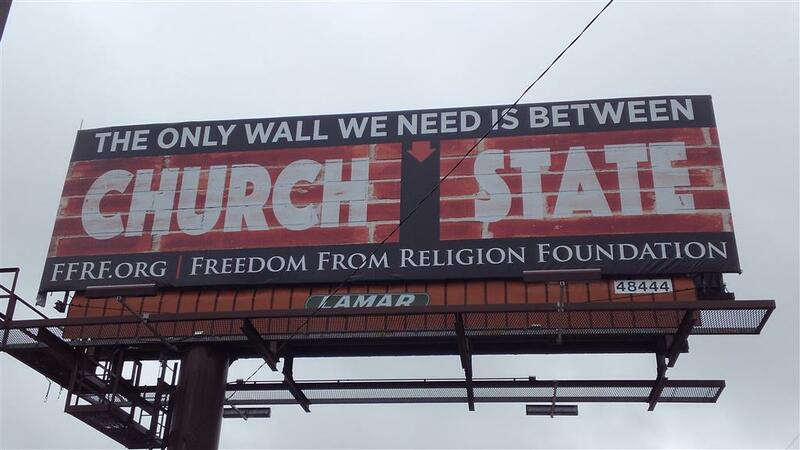 The Freedom From Religion Foundation is continuing its irreverent 2018 Georgia billboard campaign in suburban Atlanta with two new additions this August. “Enjoy life now — There is no afterlife” is appearing on a digital board on Spring Road half a mile east of Atlanta Road in Smyrna, Ga.
A contrasting message promoting the constitutional separation between state and church proclaims “The only wall we need is between church and state” on a vinyl billboard on Piedmont, near the intersection of Sandy Plains in suburban Marietta. The phrase “Enjoy life now — There is no afterlife” was coined by an octogenarian farmer, now deceased, who sponsored the message on billboards for many years in rural Wisconsin. Now Jack Egger, a local Georgia FFRF member and activist, has taken the message to heart. He is underwriting a year-long billboard campaign in suburban Atlanta to champion FFRF’s two purposes: To educate the public about nontheism, and to safeguard the constitutional separation between church and state. FFRF thanks Jack Egger for his generosity. FFRF has 32,000 members nationwide, including more than 500 in Georgia.